Please note that the Meditation Group on Friday evenings will be taking a break for the Summer vacation. I have been reading the 2nd edition of sociologist Grace Davie’s ‘Religion in Britain’ in which she develops the theme of the 1st edition: believing without belonging. Twenty years on from that her research has led her to identify vicarious religion, which she describes as “the notion of religion performed by an active minority but on behalf of a much larger number who… …not only understand but appear to approve of what the minority is doing… …for example churches… …perform ritual on behalf of others (at the time of a birth or a death for instance); if these services are denied, this causes offence, the more so amongst those who do not attend church with any regularity.” (Davie, 2015 p.6) There is a curious disconnect between the offer of baptism with conditions, to the unquestioned availability of funeral services in the Church of England, if not at St Edward’s. Amongst the churchgoers there has been “a gradual shift from a culture of obligation or duty to a culture of consumption or choice” (ibid p7 ) with people attending Cathedral services in greater numbers than before, for the beauty of the building and the music as much as for the liturgy and the anonymity. For all that St Edward’s may have been peculiar in the past, it is now firmly part of the Church of England, with a parish, and a responsibility to minister to the people who live and work here. Vicarious religion indeed. Let us work together to keep the light burning. Please note that the Monday Taize service is on pause for the summer vacation and should be returning towards the end of September. 11 am: Contemplative Morning Prayer; Officiant & Preacher: Devin McLachlan: Peace, be still! St Edward’s is a church with a long and interesting history. Over the coming months we hope to have a series in which we look at some items in our archives and discover some aspects of this history. By way of introduction, we reproduce below an historical map from around 1800 showing St Edward’s parish at that time. We can see that the map of Cambridge has greatly changed over the last 215 years. 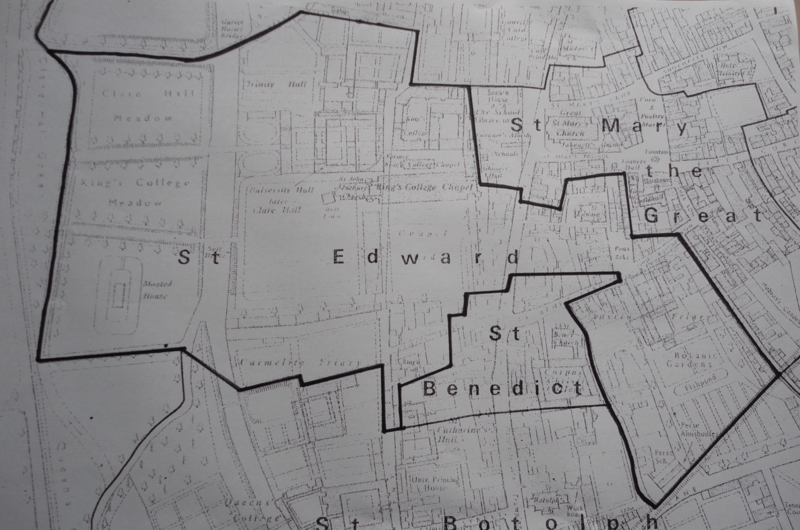 However, we observe that many of the institutions are still flourishing within our parish: King’s College and Clare College and Trinity Hall are still within our boundary. It is for this reason that St Edward’s holds the marriage registers for these College chapels, and they have to be borrowed whenever one of them has a happy event. The former Augustinian priory became the Botanic Garden, later the Cavendish laboratory and now various University departments; parts of the original King’s College are now the Old Schools, where such offices as the Vice-Chancellor and the reprographics are to be found – we are grateful to the latter for printing our service sheets and posters. We should remember all these hives of industry in our prayers for the people who live and work in our parish, and use the individual premises rather than multi-nationals – Indigo coffee house, David’s bookshop, Campkins cameras, the Arts Theatre, the Ark shop, Ben’e’ts coffee shop… so many to explore and support. Due to staffing problems the 5pm Meditative Eucharist on Sunday 14th June has been cancelled. The churchwardens and 5pm team are very sorry that this is necessary and we hope to rectify the causal problems and so not need to cancel services in the future. If you know anyone who was planning to come and does not receive these emails could you please let them know. Chapter met on the 22nd of March and 26th of April. At the meeting on the 22nd of March, the decision was taken to move forward with the sound system work; this has now been completed. We discussed the various services of the church, and in particular reviewed the progress of the 5pm service in the light of the work that Ann Kember and Brother Chris Martin have done to revitalise these services whilst keeping within the structures described in Common Worship and New Patterns of Worship. Music at the 11am service was also discussed; this is “work in progress”. The meeting on the 26th of April was the first of the newly formed Chapter, after the APCM. The focus was primarily on appointments, officers and roles for 2015 – 16. Discussion of the churchyard was deferred to the subsequent Chapter meeting. http://stedwardscambridge.co.uk/wp-content/uploads/2018/10/steds.png 0 0 St Edward King & Martyr Parish http://stedwardscambridge.co.uk/wp-content/uploads/2018/10/steds.png St Edward King & Martyr Parish2015-06-02 16:07:302015-06-02 16:07:30Hello world!